Another trip to France today to hear the story of Louis Godin, an astronomer and seismologist who saw much of the world during his lifetime. Travelling in Europe and South America he made a name for himself in Peru and Spain even as, at home, he was gradually forgotten! Born to François Godin and Elisabeth Charron, Godin was a bright and inquisitive boy with a fascination with science and astronomy. Showing a marked and prodigious talent for the field, as his teenage years progressed, Godin began studying with Joseph Delisle and by the age of 20 he had already published a seminal set of astronomical tables. This endeavour proved important in Godin's life as he was made a member of the French Academy of Sciences, who also employed him to complete a seven-volume history of the Academy and other publications. In addition, the young man was granted permission to put forward a proposal for exploratory missions across the globe in pursuit of scientific discoveries, particularly methods for measuring longitude at the equator. The plan was approved and Godin was chosen to accompany Charles Marie de La Condamine and Pierre Bouguer to Peru in 1734, where they remained for four years. The mission was not always happy and Godin broke from his colleagues to perform his own experiments. At the conclusion of the expedition Godin was invited to remain in Peru as a professor at the University of Lima and accepted the position. 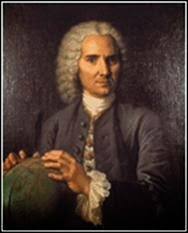 Following the 1746 earthquake he made scientific studies of the disaster, as well as assisting casualties and helping design replacement, safer buildings. Godin returned to France in 1751 to find himself virtually forgotten; his role at the Academy had been taken by another and much of his money had been lost due to careless investments. Although he would be readmitted to the Academy after five years, Godin decided for now to leave the land of his birth and travel to Cadiz to take another academic position. Here he proved himself invaluable when the Lisbon earthquake caused tremors throughout Cadiz. In the final years of his life, Godin's health failed and he embarked on a whirlwind of astronomical experiments, finally observing Halley's Comet a year before he died and leaving a wealth of unfinished and unpublished works amongst his papers. That's quite an astonishing life! I bet Peru must have been a very different place in the 18th Century. Still plenty of opportunity there for adventure and discovery even today! Another place I think I would like to visit!